. . . these concertos sing, gloriously. With the mandolin's quick decay ¿ and its lack of ornamental resource compared to the harpsichord, a more usual alternate instrument ¿ it would seem like the soul of this music would go missing . . . Avital's virtuosity and imagination are considerable; in his hands, the light, quicksilver tone of the mandolin acts like a dash of Mediterranean sun, making the concertos more ebullient, feathery. A poor soloist-ripieno balance would ruin things, but the modern strings and period continuo of the Kammerakademie Potsdam are vivid without drowning out Avital's restrained instrument . . . the album's highlight is a transcription of Bach's Flute Sonata BWV 1034; over a bed of theorbo and cello, Avital's mandolin paints a pointillist rainbow, unlikely and all the more lovely for it. This is a light and clever collection full of serious music, and a lovely summer listen. The mandolin turns out to be a fine substitute for the harpsichord in particular . . . making a selection like the album-opening Concerto in D minor sound comfortable and natural. In places where the music seems more contrived, Avital's slick virtuosity on the strings gets him through . . . Avital plays his parts so well that little is lost and old works sound fresh again. the mandolin to the fore without sounding forced . . . In the popular Violin Concerto in A minor (BWV 1041), Avital's impressive technique makes the 32nd-note passages, normally taken in one bow by violinists, seem perfectly phrased ¿ even though each note is individually plucked with the plectrum . . . The orchestral sound is magnificent throughout, and the interpretations . . . are informed by a deep knowledge of performance practice. Balance between soloist and ensemble is good overall, and the quality of the recorded sound is up to DG's usual high standard. Avi Avital ¿ his playing proffers a wide range of dynamics and tone which he modulates in an arresting manner . . . Avital proves to be a fine interpreter of Bach, the instrumentalist's sensitivity to the timelessness of the composer's music evidence of a strong sense of "the long line".
. . . awe-inspiring skill and stylish musicianship . . . Avital's playing is nimble and precise . . . the intricate elaborations of the melodic line are spellbinding. His take on the Concerto for Harpsichord, Strings and Continuo No. 5 in F minor is also intimate and elegant . . . Avital's bright, effervescent sound brings a distinctive touch to the third movement of the Violin Concerto No. 1 in A minor . . . it's time well spent. The Potsdam Chamber Academy plays very well . . . Avi Avital is an outstanding player . . . he does play Bach with passion and a firm deliberative intent. . . . I look forward to following his development, and those who love Bach will find much to savor here . . . These really are polished, exciting performances by Avital and the Kammerakademie Potsdam that veer between bracing tension and an expressive fragility. In the slow movements Avital resists the temptation to use tremolo, opting to trust the listener to mentally extend the long notes and thereby become a genuine participant in the performance; the faster movements, such as the A minor Concerto's finale, benefit from a crisp attack and sparkling articulation . . . the mandolin really comes into its own as a truly cantabile instrument, the combination of filigree transparency and intimacy allowing Avital to take far more purely expressive risks over a broader emotional continuum. The Andante [in the E minor Sonata] is worth the price of the disc alone.
. . . all three works transfer well to the mandolin, tuned like the violin. The resulting sound is entrancing. Avital stylishly meets the challenge of moulding plectrum-plucked sound into long, shapely phrases and figurations. The slow movement of the Concerto in G minor, BWV 1056R is heavenly, the brighter plectrum of the mandolin singing out above the subdued pizzicato of the orchestral strings. Equally, the singing upper line above arpeggiated broken chords in the Concerto in A minor, BWV 1041's final movement is a moment of pure technical genius . . . Avital's mandolin is hauntingly beautiful, putting this firmly on the wish-list of any Baroque enthusiast. It is a seductive sound and his playing is dazzling. Avital has transcribed for the mandolin, music originally written for three other instruments. The texture is different without being distorted. He achieves a bright and brilliant articulation in the works for harpsichord, a more lyrical virtuosity in the violin concerto and a mesmerising woody legato in the flute sonata, demonstrating not just the adaptability of the instrument but the versatility of his playing as well. His "tempi" are brisk and energised without being rushed and the slow movements are taken with becalming sensitivity . . . [the musicians are] doing more than ample justice to the sounds of the baroque.
. . . es klingt phantastisch, eigentlich, als gehörte es so.
. . . schon beim ersten Hören wird klar, wie neu diese Stücke auf der Mandoline klingen. Der helle und silbrige Klang unterstreicht die Leichtigkeit in Bachs Musik. Dadurch wird sie feiner, aber auch zerbrechlicher . . . Der berückende Mandolinenklang, aber auch Avi Avitals facettenreiches und intensives Spiel hören sich wunderbar leicht und beschwingt an. Begleitet wird Avital von der Kammerakademie Potsdam, die sich seinem Spiel mit einer klar strukturierten und zurückgenommenen Begleitung äußerst geschmeidig anpasst. Das schwebende Largo im Cembalokonzert BWV 1056, der dichte und drängende dritte Satz des a-Moll-Konzerts oder das filigran polyphone Spiel in der Flötensonate: Diese Einspielung klingt so selbstverständlich, dass man sich fragt, wieso Bach eigentlich nicht von selbst auf die Idee gekommen ist, für die Mandoline zu komponieren. Sehr erfrischend! Absolut virtuos beherrscht Avital sein Instrument, seine Fingerfertigkeit und Präzision sind schier unglaublich . . . Die Adaptionen funktionieren erstaunlich gut. Die schnellen Passagen stellen für Avital kein Hindernis dar . . . Die Kammerakademie begleitet Avital äußerst wach und aufmerksam . . . Den Geist der Bach'schen Werke fängt diese Interpretation ein, und sie macht sehr neugierig darauf, den Mandolinisten Avi Avital besser kennenzulernen.
. . . hier ist Musikalität zugegen: Auch in langsamen Sätzen hört man die sensible, elegante Gangart von Avital regelrecht sanft singen.
. . . [Avital] hebt die Bach'sche Musik damit in klangliche Höhen, wo dünne Luft herrscht, wo es einsam wird, wo die Erde und ihr Getöse ziemlich fern sind -- und der Himmel zuweilen wunderbar nah. Besonders in den langsamen Sätzen: So verträumt kann man das bekannte Largo aus dem Konzert BWV 1056 wohl nur auf einer Mandoline spielen. Und auf einer Mandoline kann das vielleicht nur Avi Avital. Das ist einfach nur großartig . . . sorgfältig im Stil, empfindsam, geschmackvoll. Beim unvoreingenommenen Hören der originalen Werke für Klavier, Violine und Flöte erstaunen die Klangvariabilität und der Farbenreichtum des kleinen Zupfinstruments: Mit Zartheit, Leichtigkeit und Raffinesse verstehen es Avi Avital und seine Mitstreiter, den Werken ein ungewöhnliches und reizvolles neues Klang-Kleid anzuziehen, das auch von der Tontechnik exzellent zur Geltung gebracht wird. Le disque témoigne des possibilités insoupçonnées d'un instrument que l'on croyait tombé en désuétude, mais qui est en plein renouveau.
. . . c'est subtil, intelligent, techniquement incroyable. Qui aurait pensé qu'un petit plectre pouvait projeter si fermement les bariolages agités du BWV 1052 en ré mineur, y trouver les contrastes et le théâtre attendus, et des couleurs si belles? . . . Un exercice contre-nature assumé avec tant d'aisance distingue forcément un grand art . . . La présence d'un orchestre de chambre (excellent) plutôt que de cordes solistes . . . peut étonner, face au petit instrument. Mais les ingénieurs du son ont fait leur travail, et les scintillements du soliste à travers la partie dense de l'orchestra produisent leur effet . . .
Avi Avital is a young man with big ideas and a very unusual instrument. Currently he looks set to become a new international superstar of the mandolin. Avi Avital overflows with charm, intelligence and enthusiasm as he describes his dreams of bringing the mandolin to its widest audience yet. His debut album for Deutsche Grammophon is, he says, “a dream come true”. He has devoted it to the music of J.S. Bach, one of his greatest musical passions. The programme features his own transcriptions of concertos best known in their incarnations for harpsichord or violin, plus a beautiful flute sonata. His story began in his home town of Be’er Sheva, Israel — where taking up the mandolin was not as unlikely a prospect as you might think. Mandolin orchestras were a popular form of social music-making in Europe in the earlier 20th century, especially in Italy and Poland; some of the refugees who escaped to Palestine before and during World War II brought the idea with them. The orchestra proved a formative influence: “It was founded by Simcha Nathansohn, an immigrant from the former USSR. He was a very charismatic teacher, but actually he was originally a violinist. This proved a great advantage, because he showed us that the music was more important than the instrument. I learned how to transmit music through an instrument — which just happens to be a mandolin.” All this was possible, of course, because the tuning of the mandolin’s strings is identical to that of the violin. After attending the Jerusalem Academy of Music, Avi Avital went to Italy where he studied with Ugo Orlandi, “a real mandolin professor, with whom I learned the original repertoire of the mandolin, rather than the transcriptions of violin music I’d specialised in until then”. This music, however, he found “beautiful, but rather limited”. Avi Avital found himself facing what he describes as something of an identity crisis: the music he most loved to play was not necessarily that written for his own instrument. How did he go about making his Bach transcriptions? “Both the harpsichord concertos on the album were probably written first for violin, though the scores were lost”, he says. “There are reconstructions for violin, and these feel organic on the mandolin — but the instrument sounds more like the harpsichord. My transcriptions fall somewhere between the harpsichord and violin versions, looking deep into the music to find out what it needs and what adaptations I can make. But the music goes far beyond the instrument. It is so absolute that I don’t really feel it has changed at all. Above all, for Avi Avital it is always the music that comes first: the instrument is just a tool with which to express it. Throughout the album — recorded in Berlin (where he now lives) with the Kammerakademie Potsdam — he aims “to underline the universality of Bach’s music”. Avi Avital is a young man with big ideas. He is determined to put the mandolin, his beautiful yet distinctly unusual instrument, firmly on to the musical map. Talking about his dream of bringing the mandolin and its repertoire to a wider audience than ever before, Avi – perhaps its first international superstar – overflows with charm and enthusiasm. For this recording, his debut on Deutsche Grammophon, he has gravitated to the music of J. S. Bach, which, as he tells Jessica Duchen, is one of his greatest passions. JD: What drew you to Bach transcriptions for your debut with DG? AA: This recording is a dream come true. I’ve always felt that my first major project must contain Bach because his music has always been a dominant part of my musical life. It is the absolute nature of Bach’s music that has given me the freedom to offer these interpretations on the mandolin. This music goes far beyond any given instrument. Why did you choose these particular works and how did you go about transcribing them? It’s more natural on the mandolin to play violin music because it has the same tuning. You need to be creative with how to play a long note, how to make it sing, how to play ornaments, and so on. But I wanted to go further: I wanted to underline Bach’s universality. lin – yet the instrument itself sounds more like the harpsichord. My transcriptions fall somewhere between the harpsichord and violin versions, looking deep into the music to find out what it needs and what adaptations I can make. The orchestra I worked with for the concerti is the wonderful Kammerakademie Potsdam, which was a great support for the challenges of these pieces. For example, the D minor Concerto involves long sections written almost continuously in semiquavers/16th notes. These carry the intensity of this incredibly dramatic piece. But if you “zoom out”, you can hear the structure more clearly. We sought to give a sense of these solid, long phrases. The A minor Violin Concerto is so well-known that the challenge was to make it sound fresh. We approached it by imagining we were encountering the music for the very first time. One of my favourite tracks is the slow movement of the G minor Concerto (BWV 1056). It has a divine melody, powerful yet not sentimental. I feel the mandolin creates a special intimacy here: the purity of the sound seems to pluck on much more ancient strings within our souls. I’ve long been enchanted by the Flute Sonata in E minor. When I was 18 I received a last-minute invitation to play it in a live radio broadcast, with just one week to prepare. That felt like a week-long meditation. I lived so much inside the music that it entered my veins. On the flute, the phrases emerge from the breathing. Playing the piece on the mandolin, you almost have to breathe in the same way as a flautist. How did you start to learn the mandolin? Growing up in Be’er Sheva, Israel, I was eight when I started attending a music school after regular school. A friend was learning the mandolin, so I decided I would, too. There was a well-known mandolin youth orchestra in town, which I joined. We played arrangements of Mozart, Bach and other classical repertoire. It was founded by Simcha Nathansohn – he was a very charismatic teacher. Actually he was originally a violinist, and this proved a great advantage, because the music was more important than the instrument. I learned how to transmit music through an instrument that just happens to be a mandolin. As I continued my studies in Israel and Italy I tried to hold on to this idea. I explored the traditional mandolin repertoire while experimenting with pieces for other instruments and commissioning new works. It then gradually became my aim to redevelop and redefine the mandolin and its repertoire. Your instrument is rather different from the traditional mandolin. This unique mandolin is the creation of the gifted luthier Arik Kerman. His commitment to constantly expand the borders of the instrument echoed mine. I was lucky to take an active part in this process, as my feedback influenced the way he crafted my mandolin. The result is an instrument with a great range of colours and dynamics. What is most special for you about Bach on the mandolin? Bach’s music is full of secrets. No matter how long you’ve been playing it, there is still something to discover every time. Using a different instrument allows you to hear its timelessness in a new way. 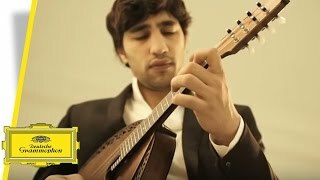 Avi Avital est un jeune homme aux grandes idées, bien décidé à imposer la mandoline sur la scène musicale – un bel instrument, mais qui sort des sentiers battus. En parlant de son rêve de faire découvrir à un plus large public la mandoline et son répertoire, Avi – qui en est peut-être la première grande star internationale – déborde de charme et d’enthousiasme. Pour cet enregistrement – son premier chez Deutsche Grammophon –, il s’est concentré sur la musique de J. S. Bach, l’une de ses plus grandes passions, comme il l’explique à Jessica Duchen. J.D. : Qu’est-ce qui vous a incité à enregistrer des transcriptions de Bach pour vos débuts chez DG ? A.A. : Cet enregistrement est un rêve devenu réalité. J’ai toujours eu le sentiment que mon premier projet important devait être consacré à Bach, car sa musique a toujours été un élément essentiel de ma vie de musicien. C’est la nature absolue de la musique de Bach qui m’a donné la liberté de proposer ces interprétations à la mandoline. Cette musique va bien au-delà d’un instrument donné, quel qu’il soit. Pourquoi avez-vous choisi ces œuvres particulières, et comment avez-vous procédé pour les transcrire ? Il est plus naturel de jouer à la mandoline la musique de violon, car l’accord est le même. Il faut être créatif dans la manière de jouer les notes longues, de les faire chanter, de jouer les ornements, et ainsi de suite. Mais je voulais aller plus loin : je voulais souligner l’universalité de Bach. Parmi les deux concertos pour clavecin de cet album, BWV 1052 fut probablement écrit au départ pour violon, tandis qu’on pense maintenant que BWV 1056 fut composé pour hautbois. Les deux originaux sont perdus, mais on a réalisé des reconstitutions pour violon, et celles-ci sonnent bien à la mandoline – encore que l’instrument lui-même ait une sonorité plus proche du clavecin. Mes transcriptions se situent quelque part entre les versions pour clavecin et pour violon, et j’explore les profondeurs de la musique pour découvrir ce dont elle a besoin et les adaptations que je peux faire. L’orchestre avec lequel j’ai travaillé pour les concertos est la merveilleuse Kammerakademie de Potsdam, qui a été un grand soutien pour relever les défis de ces œuvres. Par exemple, le Concerto en ré mineur comporte de longues sections écrites presque continûment en doubles croches. Ce sont elles qui portent l’intensité de cette œuvre incroyablement dramatique. Mais, avec un peu de recul, on entend plus clairement la structure. Nous avons cherché à bien faire sentir ces longues phrases solides. Le Concerto pour violon en la mineur est si connu que la difficulté était de le faire paraître nouveau. Nous l’avons abordé en imaginant que nous découvrions la musique pour la toute première fois. L’une de mes plages favorites est le mouvement lent du Concerto en sol mineur (BWV 1056). La mélodie est divine – puissante, mais sans être sentimentale. Je pense que la mandoline crée ici une intimité spéciale : la pureté du son semble faire résonner des cordes beaucoup plus anciennes dans notre âme. J’ai toujours été enchanté par la Sonate pour flûte en mi mineur. À dix-huit ans, j’ai été invité à la dernière minute à la jouer dans une émission de radio en direct, avec seulement une semaine pour la préparer. Cela m’a semblé une méditation d’une semaine entière. Je vivais tellement à l’intérieur de la musique qu’elle est entrée dans mes veines. À la flûte, les phrases émergent du souffle. En jouant l’œuvre à la mandoline, on doit presque respirer de la même manière qu’un flûtiste. Comment avez-vous commencé à apprendre la mandoline ? J’ai grandi à Be’er Sheva, en Israël, et j’avais huit ans quand j’ai commencé à fréquenter une école de musique après les cours. Un ami apprenait la mandoline, alors j’ai décidé d’en faire autant. Il y avait dans la ville un orchestre de mandolines assez connu, fait de jeunes, que j’ai rejoint. Nous jouions des arrangements de Mozart, Bach, et d’autres pages classiques. L’orchestre a été fondé par Simcha Nathansohn – un professeur très charismatique. Au départ, il était violoniste, en fait, ce qui s’est révélé un grand avantage, parce que la musique était plus importante que l’instrument. J’ai appris à transmettre la musique à travers un instrument qui se trouve être la mandoline. En poursuivant mes études en Israël et en Italie, j’ai essayé de m’en tenir à cette idée. J’ai exploré le répertoire traditionnel de la mandoline tout en expérimentant avec des œuvres écrites pour d’autres instruments et en commandant des œuvres nouvelles. Peu à peu, mon but a été de développer et redéfinir la mandoline et son répertoire. Votre instrument est assez différent de la mandoline traditionnelle. Cette mandoline unique est l’œuvre d’un luthier de grand talent, Arik Kerman. Sa volonté de constamment repousser les limites de l’instrument faisait écho à la mienne. J’ai eu la chance de prendre une part active à ce processus, car mes réactions ont influencé la façon dont il a conçu ma mandoline. Le résultat est un instrument avec une grande palette de couleurs et de nuances. Qu’est-ce qui est le plus spécial pour vous en jouant Bach à la mandoline ? La musique de Bach est pleine de secrets. Même si on la joue depuis très longtemps, il y a toujours quelque chose à découvrir chaque fois. Le fait d’utiliser un instrument différent permet d’entendre son intemporalité d’une manière nouvelle. Avi Avital ist ein junger Mann mit einem Kopf voller neuer Ideen, und er ist entschlossen, der Mandoline, diesem schönen, doch sehr ungewöhnlichen Instrument, einen festen Platz im heutigen Musikleben zu sichern. Die Mandoline und ihr Repertoire einem größeren Publikum als jemals zuvor zugänglich zu machen, das ist sein Traum. Wenn man ihn darauf anspricht, sprüht Avi, der wahrscheinlich erste internationale Superstar auf diesem Instru­ment, nur so vor Charme und Enthusiasmus. Für seine Debüt-CD bei der Deutschen Grammophon hat er Werke von Johann Sebastian Bach ausgewählt – und das ist beileibe kein Zufall, denn Bach, so erzählt er Jessica Duchen, ist einer seiner absoluten Lieblings­komponisten. JD: Warum haben Sie Bach-Transkriptionen für Ihre Debüt-CD bei der Deutschen Grammophon ausgewählt, wie kam es dazu? AA: Mit dieser Aufnahme wurde für mich ein Traum wahr. Ich habe immer schon gedacht, wie schön es wäre, wenn ich mich bei meinem ersten größeren Projekt auf Bach konzen­trieren könnte; schließlich spielt Bachs Musik seit jeher eine wichtige Rolle in meinem musikalischen Leben. Die Absolutheit von Bachs Musik hat mir die Freiheit gegeben, diese Interpretationen für Mandoline herauszubringen. Seine Musik lässt sich nicht auf ein bestimmtes Instrument festlegen, sie geht darüber hinaus. Warum haben Sie genau diese Werke ausgewählt und wie gingen Sie bei der Übertragung vor? Musik für die Geige eignet sich auch für die Mandoline, da beide Instrumente die gleiche Stimmung haben. Bei der Darstellung der langen Töne muss man erfinderisch sein, damit man sie zum Singen bringt, ebenso bei den Verzierungen und anderen Details. Aber ich wollte noch einen Schritt weitergehen: Ich wollte Bachs Universalität herausstellen. Das Cembalokonzert BWV 1052, das auf diesem Album enthalten ist, war wahrscheinlich ursprünglich ein Werk für Violine, und man nimmt heute an, dass dem Cembalokonzert BWV 1056 eine Komposition für Oboe zugrunde lag. Beide Originalwerke sind nicht erhalten, doch Rekonstruktionen für Violine sind überliefert; diese Übertragungen fühlen sich auf der Mandoline sehr stimmig an, das Instrument selbst klingt aber mehr wie ein Cembalo. Meine Transkriptionen stehen irgendwo zwischen den Fassungen für Cembalo und Violine; ich habe mir die Musik sorgfältig angeschaut, denn ich wollte ihr gerecht werden und genau prüfen, welche Anpassungen ich vornehmen konnte. Die wunderbare Kammerakademie Potsdam begleitet mich bei diesen Stücken, sie war mir bei diesen sehr anspruchsvollen Werken eine große Stütze. Das d-moll-Konzert hat zum Beispiel lange Passagen, die fast ausschließlich in Sechzehnteln gehalten sind, hier ist die Intensität dieses unglaublich dramatischen Stückes gebündelt. Wenn man sie aber im Zusammenhang des großen Ganzen betrachtet, rückt die Struktur stärker in den Vorder­grund. Diese blockhaften, langen Abschnitte wollten wir erfahrbar machen. Das a-moll-Violinkonzert ist ein sehr bekanntes Werk. Hier lag für uns die Herausforderung darin, es vollkommen neu und unbekannt klingen zu lassen. Also gingen wir es mit der Vorstellung an, als hörten wir dieses Konzert zum allerersten Mal. Der langsame Satz des g-moll-Konzerts (BWV 1056) ist einer meiner Lieblingssätze auf dieser CD. Er hat eine überirdische Melodie, kraftvoll und doch nie sentimental. Die Mandoline verleiht ihm eine ganz besondere Intimität, und die Klarheit ihres Klangs spricht viele tiefere Schichten in unseren Seelen an. Die Flötensonate in e-moll hat mich schon seit Langem fasziniert: Als ich achtzehn Jahre alt war, erhielt ich eine sehr kurzfristige Einladung, dieses Stück bei einer Radiosendung live zu spielen. Mir blieb nur eine Woche zur Vorbereitung, und das fühlte sich wie eine einwöchige Meditation an; ich lebte so sehr in der Musik, dass sie mir durch die Adern zu strömen schien. Die Phrasen entstehen auf der Flöte durch den natürlichen Fluss des Atems. Wenn man das Stück mit der Mandoline spielt, muss man fast wie ein Flötist atmen. Wie begann Ihre Ausbildung auf der Mandoline? Ich bin in Be’er Sheva in Israel aufgewachsen. Als Achtjähriger fing ich an, nach meinen regulären Schulstunden auch die Musikschule zu besuchen. Ein Freund von mir nahm Unterricht auf der Mandoline, also beschloss ich, das gleiche zu machen. In der Stadt gab es ein sehr bekanntes Mandolinenorchester, in das ich eintrat. Wir spielten Arrangements von Mozart, Bach und andere Werke des klassischen Repertoires. Simcha Nathansohn, ein sehr charismatischer Lehrer, hatte es gegründet. Er war eigentlich ausgebildeter Geiger, und das erwies sich als großes Plus; die Musik war wichtiger als das Instrument. Und ich lernte, wie ich Musik durch ein Instrument vermitteln konnte, das nun einmal, wie es der Zufall so wollte, eine Mandoline war. Als ich meinen Unterricht in Israel und Italien fortsetzte, versuchte ich, diese Idee weiter zu verfolgen. Ich erforschte das traditionelle Repertoire für Mandoline, während ich mit Stücken für andere Instrumente experimentierte und neue Werke in Auftrag gab. Allmählich kristallisierte sich mein Wunschziel heraus: Ich wollte die Mandoline und ihr Repertoire neu entwickeln und definieren. Ihr Instrument ist ganz anders als eine traditionelle Mandoline. Diese einzigartige Mandoline hat der talentierte Gitarrenbauer Arik Kerman geschaffen. Er ist, wie ich, ständig darum bemüht, die Grenzen des Instruments zu erweitern. Ich hatte das Glück, an diesem Prozess aktiven Anteil nehmen zu können, denn meine Kommentare beeinflussten die Art und Weise, wie er meine Mandoline baute. Das Ergebnis ist ein Instrument mit einer großen Klangfarbenvielfalt und Dynamik. Was ist für Sie das Besondere an Bach auf der Mandoline? Bachs Musik ist voller Geheimnisse. Egal, wie lange man sie schon spielt, immer gibt es etwas Neues zu entdecken. Wenn man ein anderes Instrument einsetzt, kann man die Zeitlosigkeit dieser Musik auf ganz neue Weise erleben.